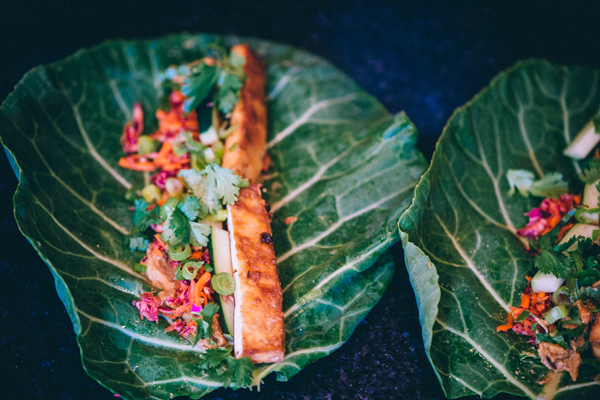 Meatless Monday: Tofu Bahn Mi Collard Wraps | Move your Assets! The LifeVest office has been eating well lately, and we want you to join in with us! For our last company lunch, our food blogger and LifeVester Grace brought us these Tofu Banh Mi Collards Wraps. Banh mi is a traditional Vietnamese sandwich, generally filled with some type of protein, and layered with cucumbers, cilantro, pickled carrots, and sometimes various other veggies. In its translation, the word “Banh mi” actually means loaf, or slice of bread, so generally, you’ll find all of those ingredients encompassed by an airy baguette. Grace’s version, however, is obviously a bit different — and healthier, too! Ditch white bread, seize some autumn greens, and get wrapping. You can easily make these the night before, and pack them in aluminum foil for a grab-and-go lunch you can feel good about. Head on over to Grace’s blog for the recipe.